Best Starts for Kids (BSK) is an initiative to improve the health and well-being of King County by investing in prevention and early intervention for children, youth, families, and communities. The levy will generate about $65 million per year and cost the average King County property owner an estimated $56 per year, which is about one dollar per week. It will be the most comprehensive approach to early childhood development in the nation, starting with prenatal support, sustaining the gain through teenage years, and investing in healthy, safe communities that reinforce progress. 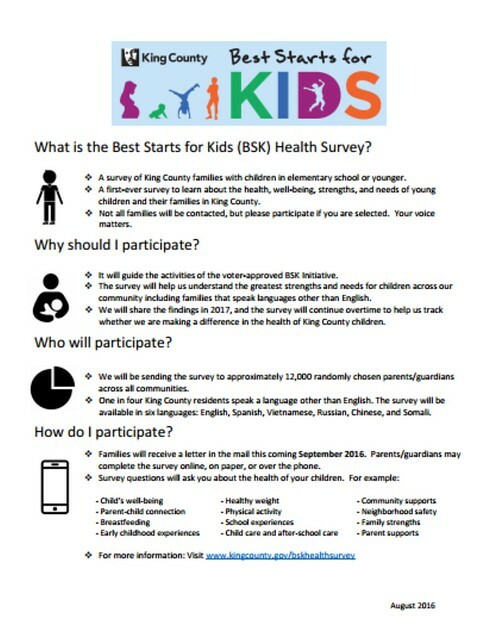 Best Starts for Kids (BSK) is an initiative to improve the health and well-being of all King County residents by investing in promotion, prevention and early intervention for children, youth, families and communities. The Best Starts for Kids Levy is rooted in the fundamental belief – from within King County government, and across King County’s richly diverse communities – that our county is a region of considerable opportunity, and that we all benefit when each and every County child, youth and young adult is supported to achieve his/her fullest potential. Lives of health, prosperity and purpose must be within reach for every King County resident. With Best Starts for Kids, we will work to assure that neither zip code, nor family income, constrain our young people from pursuing lives of promise and possibility. Best Starts for Kids materials are available in other languages through the County’s website.